Those nitrate ions combine with other minerals in the soil (metal carbonates, for example) to make a mixture of calcium, magnesium, and potassium nitrates (I will refer to these as "metal nitrates"). More and more of these metal nitrates can accumulate over time due to the absence of nitrate-ion-consuming life such as plants in the soil of the animals' stables. Eventually the soil can become so saturated with metal nitrates that crystals of these substances grow beneath stable floorboards or along the walls of adjacent cellars. Metal nitrates (a.k.a. 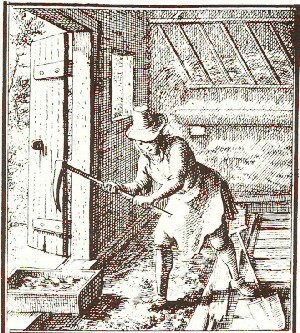 saltpeter) being extracted from underneath stable floorboards by a "saltpeter man" or "peterman"
You might ask "What does all this have to do with explosives?". We're getting there, trust me. Before humans could use the metal nitrates for really big and reliable explosives, they had to figure out how to purify them. The problem with the mixture of metal nitrates produced by nitrification of urine is that it gives a mixture of metal nitrates, when what you really want is potassium nitrate. The calcium and magnesium nitrates soak up too much water from the air, which diminishes their explosive potential. Arab scientist Hassan Al-Rammah (inventor of the torpedo) was one of the first people in history to leave a clear record of how to isolate pure potassium nitrate in his epically-titled 13th century text "The Book of Military Horsemanship and Ingenious War Devices" (!!!!). He described dissolving the metal nitrate mixture in water, mixing the resulting solution with wood ash (which has lots of potassium carbonate, as we discovered in this fire post), then filtering and crystallizing. 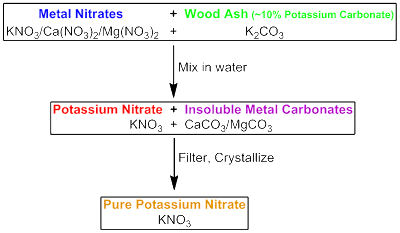 Using wood ash serves to swap out all the undesirable calcium and magnesium ions from the crude metal nitrate mixture for desirable potassium ions from the wood ash, resulting in pure potassium nitrate. 13th-century chemistry used pee-breakdown products and wood ash! Insane! As the heap ripens, the nitre is brought to the surface by evaporation, and appears as a whitish efflorescence, detectible by the taste. What ingenuity humans have! Amazing! Also, tasting crystals that grew off a pee/straw mixture is pretty surprising! Now that we have pure potassium nitrate, let's continue our trek towards understanding its use in explosions. The picture below is another way to think about nitrification, and it shows the HUGE volume of oxygen gas that it takes to make a tiny volume of nitrates. For this reason, you can think of potassium nitrate as if it is solidified oxygen. This is very important to why it is good for use in explosives. A comparison of the volumes of reactants and products in the nitrification process. Roughly 200:1, if you want numbers. 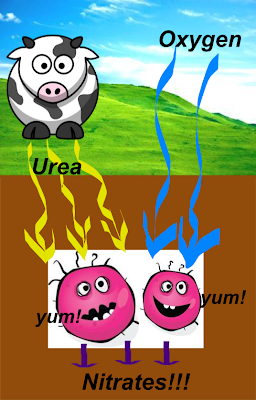 Nitrates can be though of as an extremely dense form of oxygen. So why does "solidified oxygen" help with explosions? Most explosions are simply combustion reactions that happen really really fast. In normal combustion reactions, the rate at which something burns is limited by how fast the oxygen molecules can reach the flame. 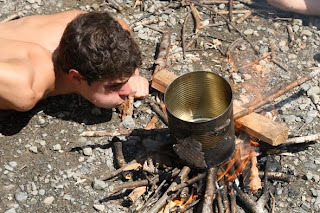 That is why blowing on kindling of a campfire helps it burn faster and brighter, because you are increasing the rate at which oxygen molecules reach the fire. Young dude, increasing the rate at which oxygen molecules reach his nascent fire. So, when you mix potassium nitrate ("solidified oxygen") with some sort of fuel (charcoal, for example) and set the mixture ablaze, the resulting reaction doesn't have to wait for the lazy lumbering oxygen gas molecules to arrive, because it has all the oxygen it needs right there in the form of the potassium nitrate. Therefore, the combustion occurs nearly instantaneously. Imagine taking all the energy that is released from a campfire throughout the course of an evening and releasing it all at once. That's right...KAPOW!!!! Now this discovery didn't really revolutionize human civilization until we figured out how to use it to kill each other. Gunpowder is made by mixing potassium nitrate with two fuels (i.e. atoms that can combine with oxygen atoms and release energy), carbon (charcoal) and sulfur. The oxygen atoms leave the nitrates and move onto the carbon and sulfur atoms, releasing a buttload of energy. This process is so explosive because the "solidified oxygen" is turned into products that are mostly gases (carbon dioxide, etc). The gaseous products take up lots more room than the solid starting materials...which explains the KAPOW. 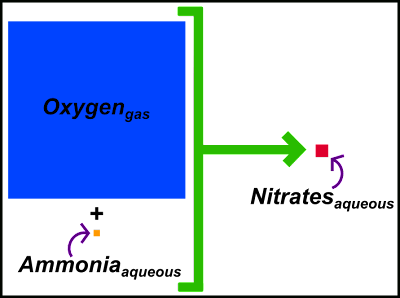 This ultra-mixture is then so primed to undergo the oxygen exchange reaction that a small spark, amount of heat, or mechanical shock will set it off. The thing that sets off this reaction in modern guns is called a percussion cap. MIND-MELT-RECAP: the dawn of agriculture gave us animal stables, which gave us LOTS of pee, which gave us metal nitrates, which we somehow learned how to purify, which eventually gave us the worlds' first explosives, which we eventually turned into gunpowder! Agriculture to cow pee to guns! Who knew?!! Nice article, one minor point, it is very hard to ignite black powder by pure mechanical shock unless that shock either creates a spark or generates enough heat to ignite the fuel. Yes, it can happen, but I sure wouldn't want to have to count on it as an ignition source. Awesome detail, thank you! I haven't had much opportunity to mess around with black powder myself, unfortunately. I really appreciate your insight! Fun article to read, any cost effective way to get the Hydrogen to release from the Nitrogen and Oxygen in the ammonia? Hydrogen for fuel would rule! Enter your comment...Nice article! Please i am interested in knowing how one prepare potassium niitrate in the laboratory using human urine. Great article, however I must emphasis that 'inventing' and 'conceptualising' are two very different things! Al Rammah was not the inventor of the torpedo, just like Leonardo D. didn't invent the aeroplane, but rather the Wright Bro's. Very important point! I agree I should have used a different word there. Thank you!